We may have over done the cockiness about the weather, Saturday evening it hammered down accompanied with gale force winds. Nothing to worry about, unless like us you had pitched up on a marina and were 5 ft from the waters edge! Those dyke builders knew their stuff, come morning not an inch of water had crept over our tyres. Over the weekend Iain noticed one of our headlight covers had been swipped. We found it very annoying that some lazy / tight sod couldn’t go and buy their own as they are £40 each. We spent a good few days be-moaning whether it was the German in the Fiat next to us on Saturday, or did it happen in Lidl car-park, or at the freecamp where the neighbour next door was very friendly etc. Puzzle solved when Iain looked at his photos yesterday- the cover has been missing since we left home!! So apologies to the Dutch and Germans, typical some git from Rhyl stole it! 😦 . 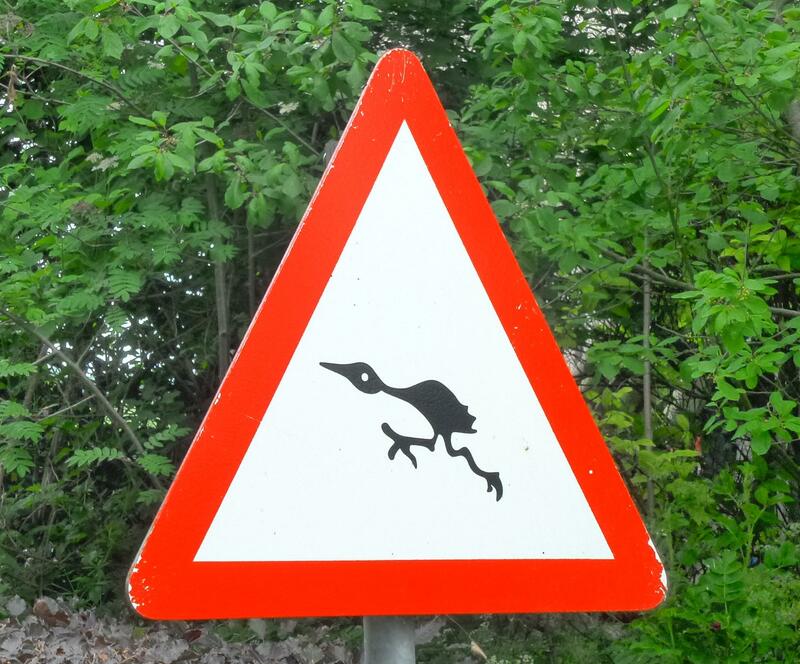 Beware of alien chicks ! Sunday the wind dropped and the clouds stayed so we made some use of the myriad of cycle paths. Our latest awe and wonder is that not only are there bike paths, they are double lane paths – like a bike dual carriageway, pedestrians have their own separate paths and the cyclists have their own traffic lights at junctions – cycling does not get cooler than here. We took a circuit around one side of Lauwersmeer, stopping for coffee when we were hit by a quick shower, then coming back across the damn followed by a wander around the docks. Possibly one of the biggest fishing fleets we have ever come across – although as we come across it all moored up in dock its maybe not the most active of fishing fleets. 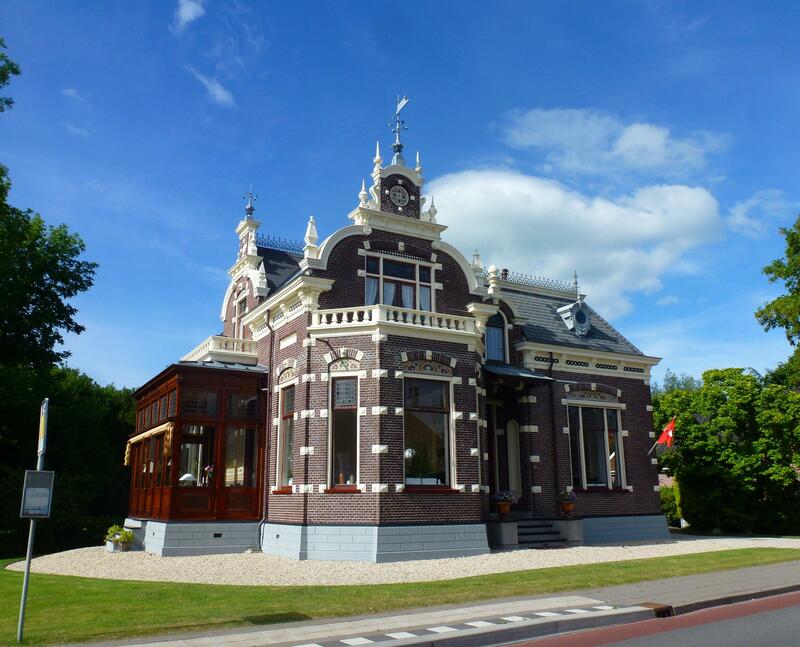 Stunning Dutch house with our name on it! 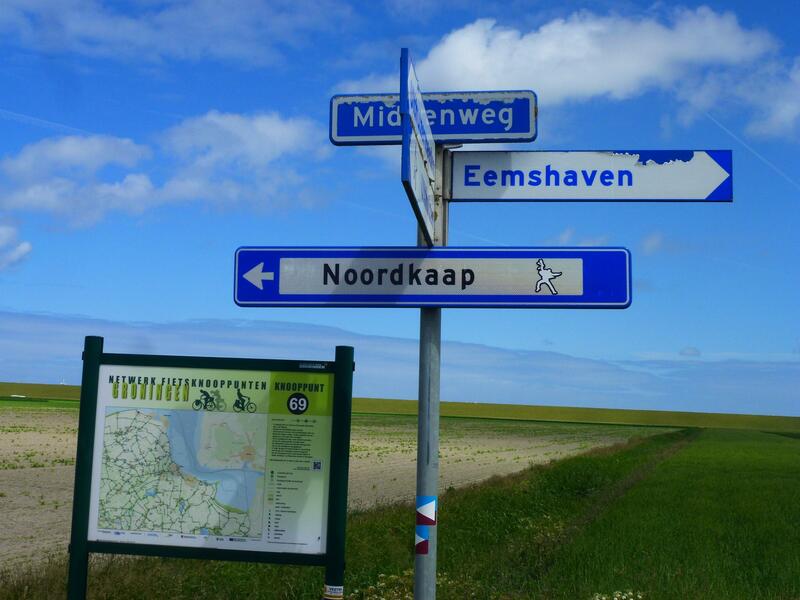 Our route over the last few days has been a slow amble along the coast to Eemshaven (even managing to visit Noordkapp so that’s one off the Norway list then!!). The far North East of the country is basically empty, there is a dock which goes on for miles, hundreds of wind-farms and very little else. We drove around the docks mainly because we could, covering miles and miles there were no restrictions on where you could go so we drove down to the ferry for Borkum – the first of the German islands. For whatever reason there isn’t a ferry from Germany, possibly why there were something in the region of 200+ German registered cars in the foot-passengers car park. We considered crossing, saw the prices and re-considered, will save islands for Norway. Tourism at this end of Holland seems to revolve purely around the lakes, of which of course there are many, all of which have several harbours, more yachts that you could shake an oar at and plenty of windsurf and sailing schools. 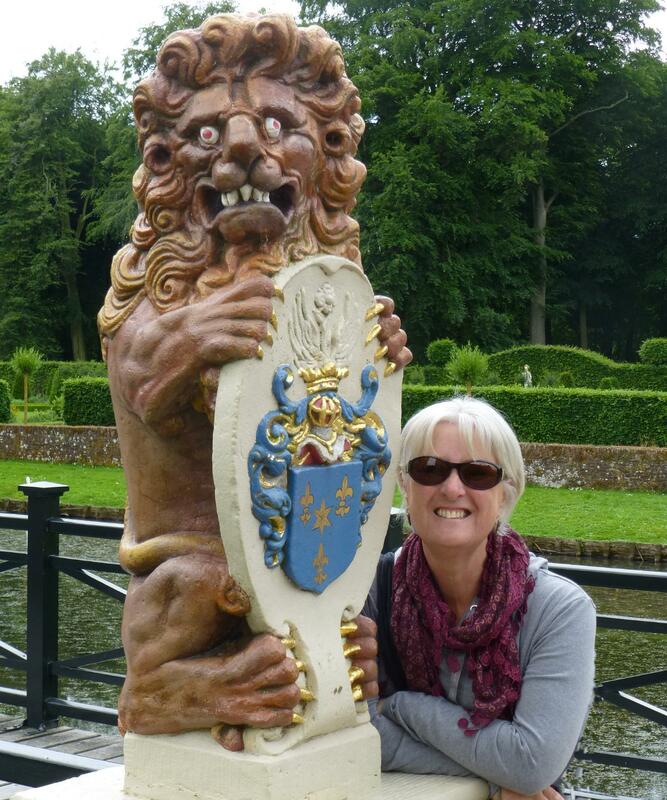 Looking out for a bit of culture to vary the watery aspects of the week we spotted Menkemaborg on the map so made a detour to see our first Dutch castle. Not so much a castle, more a large 14th century brick built, moated, manor house set in fabulous gardens. The ticket office hadn’t opened for the day (a sight of joy to Iain’s Yorkshireness) so we had a free wander around the grounds and were very taken with the gargoyles. 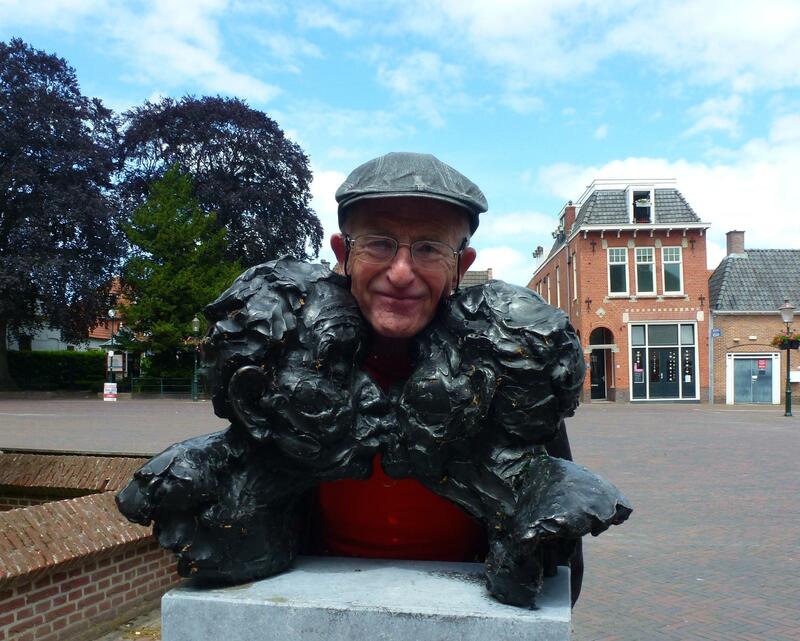 On our way down the coast we happened on Appingedam, for us the quintessential Dutch town. The canal runs through the centre of town, where it is flanked by medieval houses and crossed by iron and stone bridges. 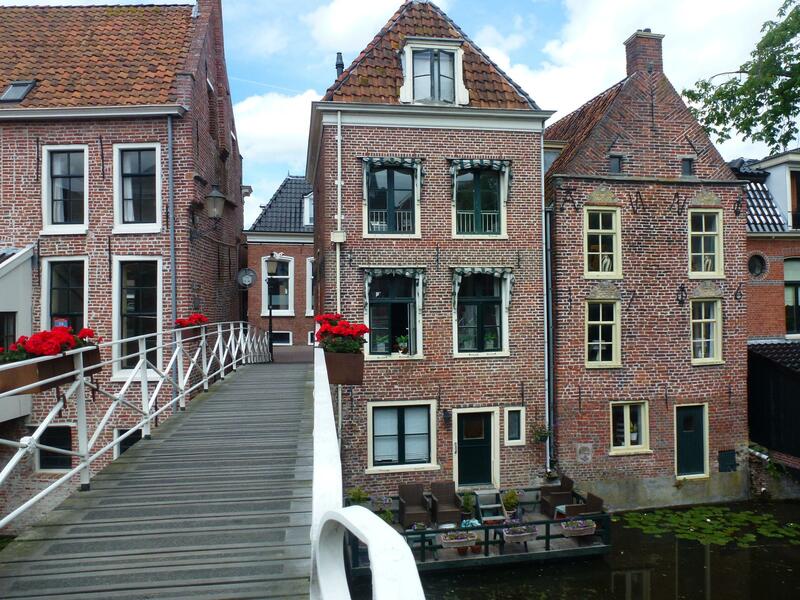 The town is famous for it’s ‘hanging kitchens’, being extensions to the houses than literally hang out over the canals. Plenty of cutesy shops selling all sorts of tourist tatt but hardly a soul around even though it was a sunny June day. We were told by a Dutch man that this is the poor part of Holland, it doesn’t seem so looking at the houses and villages with everything kept as neat and tidy as a new pin. Last night we pitched up at a campsite in the village of Midwolda, there is no shortage of campsites here every village has at least two or three. This morning it was another cycle trip – this time over to Germany. 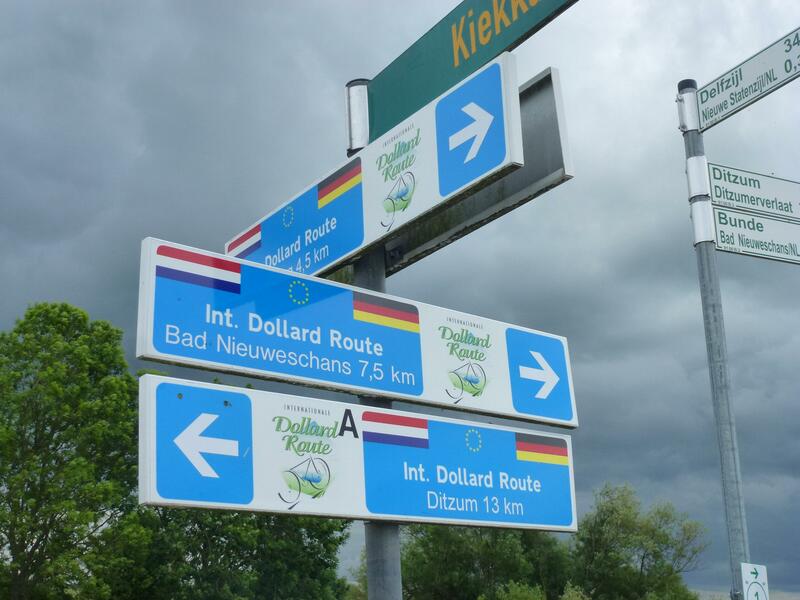 We followed the Dollard Route for several miles to the border, which we assume we crossed as the car plates were white instead of yellow and had a D instead of NL. On the way back we stopped at a bike shop, again, to look at electric bikes – Holland is dead flat and every Dutch person has an electric bike, second-hand ones cost as little as €200 – we have been tempted. Whilst having a peruse we were approached by a Dutch guy who chatted then insisted we came to his house to see his motorhome. As you do, we did. A tour of his much loved Rapido, an introduction to Mrs Dutch and then a full tour of their very lovely bungalow and garden. They are heading for Denmark and Norway at the end of the month so we agreed to look out for each other (and maybe snaffle a go on their electric bikes – he owned the bike shop! ).